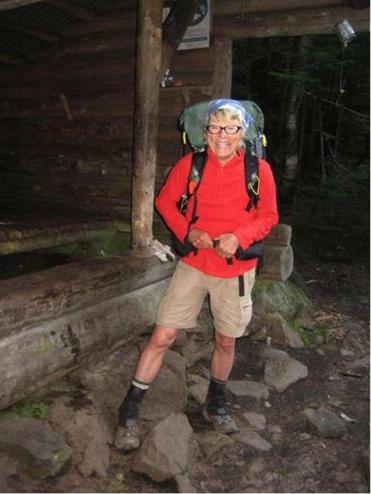 On July 22, 2013, 66-year-old hiker Geraldine Largay stepped into the Maine woods and disappeared without a trace. The last known photograph of Gerry Largay, taken shortly before she vanished on July 22, 2013. 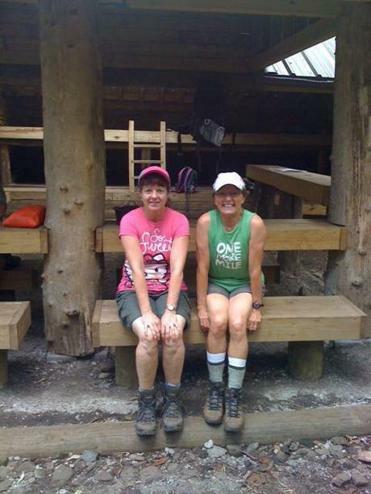 ON SUNDAY, JULY 21, 2013, Dottie Rust and her hiking partner, Regina Clark, made their way from Carrabassett River to Poplar Mountain, part of an ambitious hike across a section of the Appalachian Trail in eastern Maine. The terrain was challenging, but conditions were good that day: sunny skies, cool temperatures. The two hiked down Lone Mountain, crossed a couple logging roads and streams, then began a steep ascent up Poplar Ridge. Clark is a faster hiker, but Rust is more experienced, so the latter would call out periodically, reminding her partner to look for the white blazes delineating the trail. She has never been heard from since. Gerry Largay (in green) with hiking partner Jane Lee. EVERY YEAR, more than a half million Americans are reported missing. The majority of these reports are quickly canceled — either the individual is found or was never really gone at all. Still, there are approximately 80,000 active missing person cases at any given time in this country. These cases usually fit into neat categories. About 40 percent of them are children, either runaways or taken by their noncustodial parents. The adults who get lost tend to be struggling with substance abuse or mental health issues, or be elderly and suffering from Alzheimer’s or other forms of dementia. Those who go missing voluntarily tend to be younger and escaping some kind of legal bind, like overdue child support or an arrest warrant. Murder victims are often either transient or male or both. Gerry Largay defies all of these categories. She had retired from a successful career as a nurse in 2011. She was active in her church and social clubs. She was a doting grandmother and a popular community member. The ongoing search to find Gerry also defies everything in the long experience of the agency in charge of it, the Maine Warden Service. Adam and his staff can think of only one other case in the Warden Service’s 135-year history that resembles Gerry’s: Bob Smith, a 70-year-old hunter who disappeared in November 1997. For more than a week, hundreds of searchers combed the area where he was last seen, walking shoulder to shoulder over 17,000 acres, draining beaver bogs, and logging countless hours of flying time. Some people suspect foul play, though investigators never found any evidence to support that. There is no evidence to that effect in the Gerry Largay case either. Nor is there any indication that she was injured or became disoriented. And that’s the real problem: The wardens don’t have evidence of any kind that could prove what happened to her. No backpack, no hiking poles, not even the orange emergency whistle she kept close at hand. Gerry was no novice outdoorswoman. For eight years, she and her trekking partner, Jane Lee, attended a hiking camp in the Smoky Mountains. When they decided to attempt the Appalachian Trail, they undertook long practice hikes. Gerry also attended courses and seminars designed for thru-hikers. One of them was a five-day institute with Warren Doyle, who has completed the journey a record 16 times. 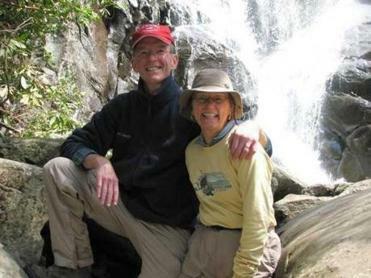 Doyle’s nickname among hikers is the “Yoda of the AT.” He remembers thinking Gerry was smart, competent, and realistic — the kind of person to keep her head on straight, no matter the circumstances. Trail markers from the area where Gerry Largay disappeared. Before departing on her full Appalachian Trail hike, in April 2013, Gerry chose her trail name: “Inchworm.” She knew it would take her a long time to finish the journey. A recurring back problem meant that she couldn’t carry the 30 or 35 pounds of gear shouldered by most thru-hikers, so Doyle worked with her to create a plan whereby George could assist her. Doyle highlighted every place where the 2,100-mile trail crosses a road. Those were where George could meet up with Gerry and Jane Lee to refuel their supplies (because of this work, George chose the trail name “Sherpa”). At the end of a day, he’d park at the next trailhead and hike in an hour or so to meet the trekking partners; then they’d spend their night at a campground or a motel with a hot shower. Between April and July, this routine became 69-year-old George’s full-time job. Sometimes he’d do a little sightseeing or hole up in a coffee shop with a copy of The Wall Street Journal or New York Times. When things got hard, he’d ask Gerry what she wanted to do. This was her dream, but he was ready to get on with the next chapter of their life. Gerry always wanted to soldier on. In time, George stopped asking. Just as they were entering New Hampshire’s White Mountains, a family emergency sent Lee home. Before she left, she asked Gerry to reconsider going on alone: The two could finish together next summer. But Gerry was resolute; she was continuing on. Lee asked her friend to be careful. Gerry was. And she wasn’t always alone. 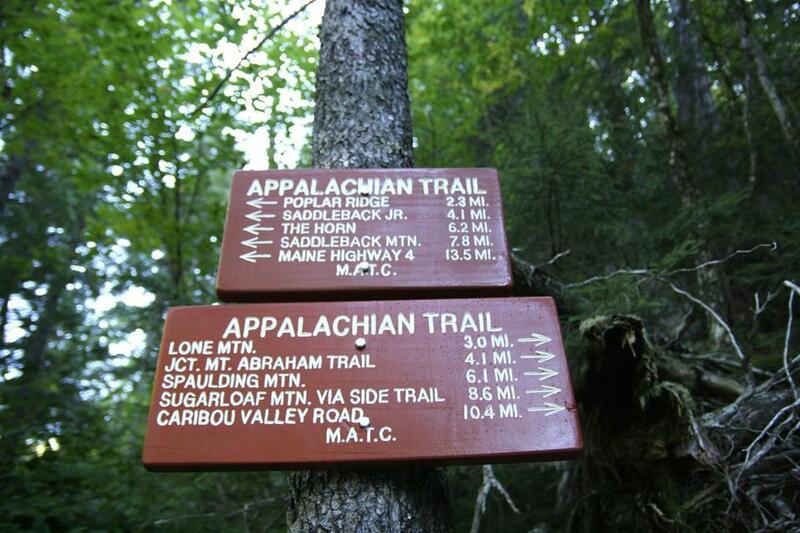 Appalachian Trail hikers form a tight community. In Vermont, Gerry and Lee had met a 72-year-old woman with the trail name “Tenderfoot,” working on her third hike of the trail. In New Hampshire, while she was hiking solo, Gerry walked awhile with a man who went by the trail name “Blue Moon.” She also met a family from eastern Canada and worked on her French. 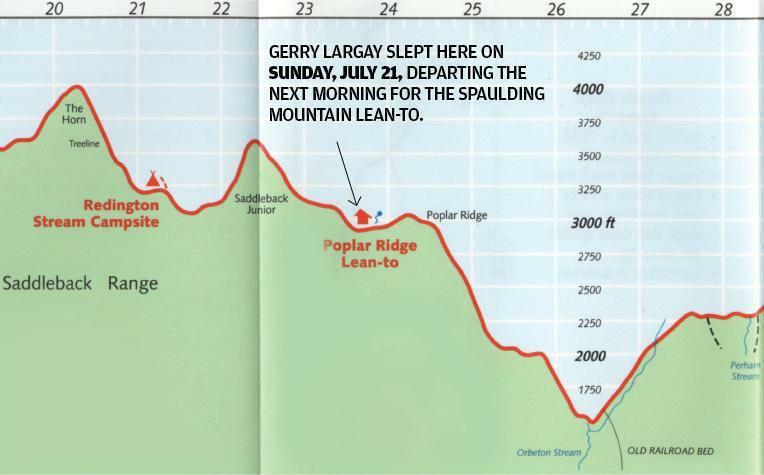 The last section of trail Gerry attempted is one of Maine’s toughest: 32 miles up and over seven mountain peaks. Doyle had told the Largays that the logging roads crossing the trail there are sometimes impassable and always hard to find. The couple decided Gerry would undertake the section as an unassisted three-day backpacking trip. On the morning of Sunday, July 21, George hiked her in a little farther than he usually did — he knew he wouldn’t see his wife for a while. THE RAIN BEGAN before dawn on Tuesday, July 23, and didn’t let up until afternoon. Gerry was due at the trailhead near Route 27 by that evening. George hated hiking in the rain. He can’t remember if he hiked into the trail to meet Gerry that day or Wednesday, but whichever day it was, he didn’t go more than a few hundred yards. When nightfall arrived and Gerry still hadn’t, he decided to sleep in his SUV. He figured Inchworm had been held up by the rain, but he wanted to be there, just in case she popped out of the woods. On Wednesday, George began to ask hikers if they had any information about his wife. No one did. Early that afternoon, he hailed a police car driving by. “It was time to send up the flares,” George says today. Not long after, two Maine wardens arrived on the scene. They asked about Gerry’s hiking habits. They probed her personal life: How was their marriage? Her credit score? Did she have any vices? What was her state of mind? “Search-and-rescue is an information game,” says Warden Eric Blanchard. “We need to get people to trust us enough to tell us everything they know — even if they don’t want to.” Maine game wardens have all the judicial power of other state law enforcement officers. When initiating a search, they can access a person’s phone, computer, and medical records. They can check financial records and arrest history. In this case, the background research turned up nothing suspicious, says Kevin Adam, the state search coordinator. Starting that afternoon, wardens and K9 teams conducted a so-called hasty search — a technique that scours likely areas and paths of least resistance. When a missing person is alive, a hasty search is almost always enough to locate them. But they found no sign of Gerry. 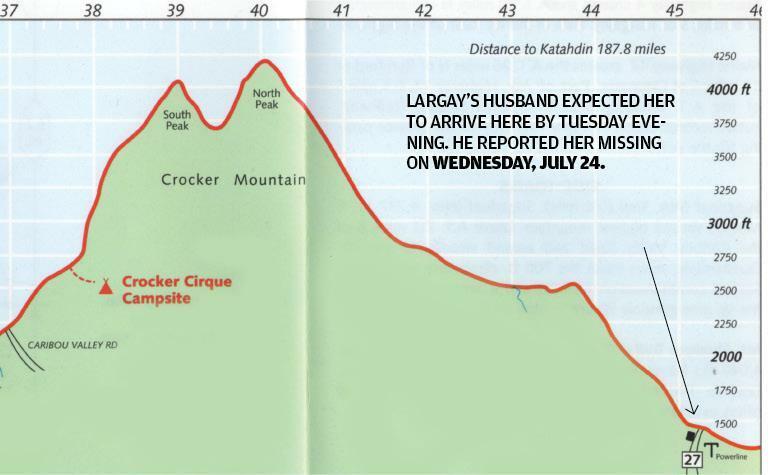 At that point, says Adam, one thing was clear: Gerry Largay was not on the trail. Gerry Largay (in black) and a hiker with the trail name “Ivanich” at the Poplar Ridge Lean-to on July 21, 2013. WEDNESDAY, two days after Gerry was last seen, was also Kerry Bauchiero’s 35th birthday. She thought it was strange that her mom didn’t call: The two had always been tight, and they were even more so now that Kerry was a mother herself. She was worried, but not enough to call her dad. Gerry didn’t call her daughter Thursday either. That night, Kerry and her husband, Ryan, turned in around 9 at their Tennessee home, turning off their cellphones before getting into bed. Not long after, they heard a knock at their front door. It was Ryan’s brother: He’d read about Gerry’s disappearance on Twitter. “At first I was shocked,” says Kerry, “and then I kind of fell apart.” She phoned her dad, who told her not to worry. George told his daughter there was no reason for her to come to Maine — the wardens would find Gerry in a day or two. But Kerry’s husband was already booking plane tickets and arranging for their two kids to stay with his parents. The couple left Tennessee at 5 the next morning. By the time the Bauchieros arrived in Maine, the search for Gerry was a major operation, complete with a mobile command unit established at the Sugarloaf ski resort. Wardens told Kerry they were operating on two big leads: a phone call and a reported sighting. 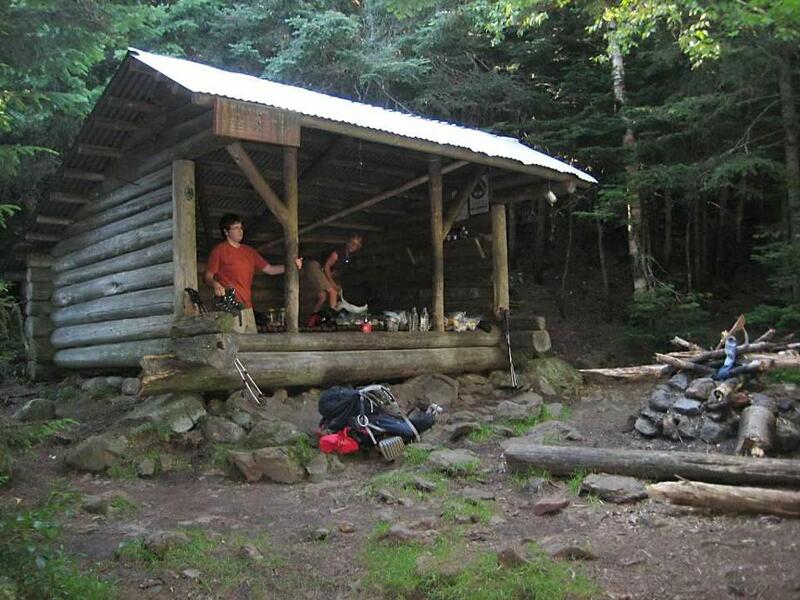 The Stratton Motel serves as a hostel and clearinghouse for thru-hikers. Its owner, Sue Critchlow, regularly pitches in as their shuttle and answering service. She recalls an unidentified person calling on Wednesday and claiming to have spent Tuesday night with Inchworm at the Spaulding Lean-to, the shelter Gerry had been planning to use on Monday night. Her husband is waiting for her at Route 27, said the caller. Tell him she’s going to be late. Critchlow says the voice sounded like a woman’s, but that’s all she remembers. 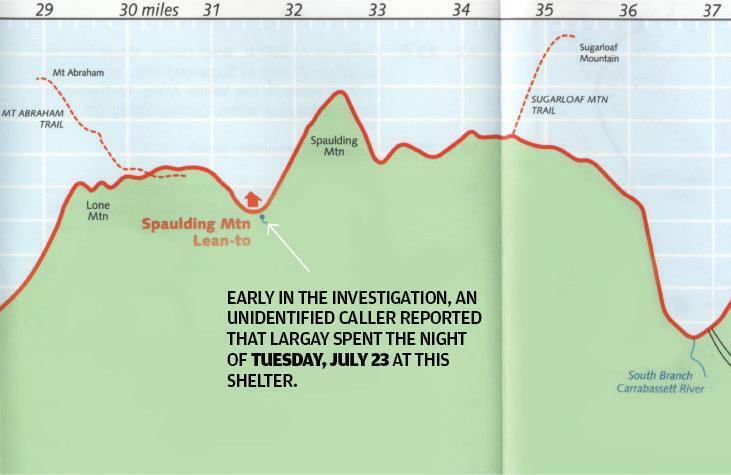 Meanwhile, wardens on the trail came across three young men who had been hiking south on Monday afternoon and said they passed Gerry about 3 p.m., just 3 miles or so shy of the Spaulding shelter. Both leads were enough for searchers to focus on that area. But both leads have since dissolved. Upon further inquiry, investigators decided the three hikers were mistaken about seeing Gerry. They now believe the men encountered a hiker with the trail name “Ivanich,” the same quiet woman who’d spent Sunday night at Poplar Ridge with Gerry and the others. When wardens tracked Ivanich down, she told them she left a couple of hours after Inchworm on Monday morning. Since Ivanich is a faster hiker, she probably should have overtaken Gerry sometime that afternoon. But she said she hadn’t seen anyone on the trail until encountering the three young men hiking the other direction. In addition, no one has come forward and admitted making the mystery call to Critchlow, despite widely publicized pleas. Wardens eventually began to discount it, saying it was a simple case of someone getting their information confused. They no longer believed Gerry spent either Monday or Tuesday night at the Spaulding Lean-to. Instead, wardens began focusing on the difficult terrain back near Poplar Ridge. Wardens also obtained evidence from Gerry’s cellphone, which Kevin Adam says received a text from a relative on Monday morning and another that afternoon from George. In both cases, there was a delay between when the texts were sent and received, and that was important. As she hiked, Gerry tended to keep her phone turned off and stowed in her pack, only powering it up periodically. Forensic experts say phones don’t receive texts when they’re off, so the delivery delays were likely due to one of two things: Either someone turning on the phone, or moving it in and out of tower range. Did that mean Gerry was alive and mobile at least into Monday afternoon? Or could it be that someone else had her phone? AS THE NEXT WEEK progressed, so, too, did one of the largest searches in Maine history. 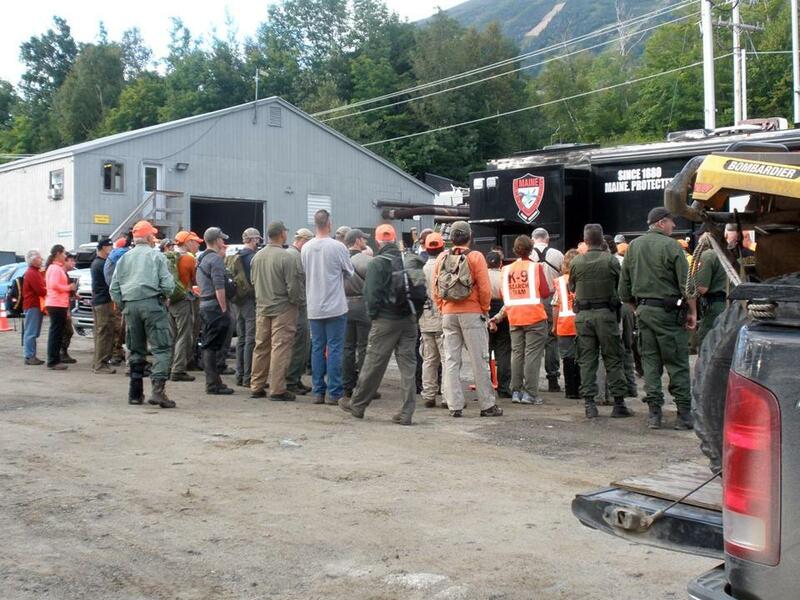 More than a hundred trained searchers took to the trail and surrounding areas. Some rode on horseback; others came with scent dogs. State Police, Warden Service, and Civilian Air Patrol helicopters and planes crisscrossed the region. Psychics and Bigfoot hunters volunteered, too. The searchers found dozens of energy bar wrappers, along with trekking poles, sunglasses, and even individual threads of fabric. Not a single one of them belonged to Gerry Largay. In cases like this, wardens are quick to follow the lead of their K9 teams. Twice, Norm Lewis was convinced his dog, Clyde, had found Gerry’s trail — the only time Lewis had ever seen Clyde act with that much determination was when he had stumbled upon a missing person. But try as they might, the two couldn’t find her. Deborah Palman, a retired warden and president of Maine Search and Rescue Dogs, also felt strongly that her team had indicated on a scent, only to turn up nothing as well. Scent searching is a complex, almost ephemeral science. The microscopic particles dropped by our bodies rise in warm air currents — sometimes up and over significant features like ridges — then pool in valleys and other cool spots. Heat can kill their potency. A pouring rain, like the one that occurred the day after Gerry was last seen, can temporarily diminish them. Warden Service dogs are generalists — they’re trained to find both live people and cadavers. Palman and Lewis say it’s hard to know which their dogs think they found out there. Gerry with her husband, George. State Police investigators employed one of their cadaver-specific canines during the search as well. They also felt that dog had caught a scent. Some of the human volunteers reported a strong smell of decay near Barnjum Road, one of the logging roads a few miles north of Poplar Ridge. But when wardens searched there, no one could find the source. That, says Palman, is just the nature of the business. It’s not uncommon for even a highly specialized, trained dog team to pick up smells that are yards — or even miles — from a body. Palman believes something or someone was out there. But she has no proof it was Gerry. After a week, Kerry began to fear the worst. At Adam’s suggestion, Gerry’s family returned home. Later that week, George held a press conference of his own. Sitting in the boardroom of a PR firm in Nashville, he told reporters that while he would always hold out hope, it was time to move on. He would host a memorial service for his wife in October. Some in the hiking community reacted to George’s announcement with criticism. It was too soon to give up, they said. Wardens were still searching. There was more to be done. But George wanted a ceremony to celebrate his wife’s life. But if there was any closure to be had at the memorial, Kerry didn’t find it. “There are still too many unanswered questions for that,” she says. Searchers gather before heading into the woods. THE NEARLY 18 months since Gerry’s disappearance have done little to quell questions. Two weeks before Gerry’s memorial service, George issued a $15,000 reward for any information relating to the case. He’s begun volunteering at the PR firm where he held his press conference and participating in ministries at his church, where he’s also having a stained glass window and a marble statue installed in Gerry’s memory. He’s learning to cook and how to do laundry. He’s trying to move on — he knows that’s what Gerry would have wanted. This autumn, wardens advised George to increase the reward for information. It now stands at $25,000. Along with volunteers, wardens also returned to the woods surrounding Poplar Ridge. They didn’t find anything, but all that says to Deborah Palman is that they weren’t close enough for any scent to register. Gerry’s hiking friends continue to mull over details of the case. They say there are gaps and inconsistencies that need more attention. A flier of Gerry Largay tacked on a tree in the area. Lee thinks a lot about Gerry’s trail habits, too. Like most thru-hikers, she would always leave her backpack on the trail when she stepped off to relieve herself. 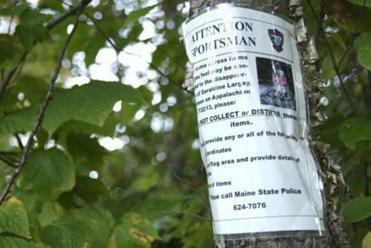 Even if she had gotten disoriented while doing so, her pack would have been found. Gerry was also religious about stopping for breakfast, usually between 9 and 10 a.m., and would check her phone for messages then, as well. On the day she disappeared, her phone was on to receive the text from the relative around that time. As for the possibility of an injury, really the only place where Gerry could have fallen and gone unnoticed is that precipitous spot where Rust and Clark stopped before meeting her at the lean-to. But Lee says she has a hard time believing her friend would have stepped off the trail there — Gerry was an exceedingly cautious hiker. Besides, she should have reached that area less than an hour into her hike. Why, then, was her phone turned on and receiving texts hours later? Gerry’s friends want to know more about the mysterious phone call, too. The person on the line knew really specific information about Gerry, including her trail name and where George was waiting. You’d only know that kind of thing if you had spoken with her. Neither Rust nor Clark made the call. So who did? And why? From left: Thanking searchers are a friend of the family, Gerry’s daughter Kerry, husband George, and son-in-law Ryan. They also point to the logging roads Gerry would have crossed. Inchworm was small, just 5-5 and 115 pounds. Could someone have abducted her? Kevin Adam says he’s far from done trying to answer these questions. The case still wakes him up in the middle of the night, and he’s replayed every scenario a million times. He knows crime is rare on the trail. Since the Appalachian Trail’s completion in 1937, only a handful of people are known to have been murdered on it. In each of those instances, bodies of the slain were found near where they died. Gerry is out there somewhere, says Adam. He just hasn’t looked in the right spot yet. Until he does, everything else is really just a best guess. Adam is a patient guy. This time of year, New Englanders hunker down. Someone might be waiting for the right time to talk. In a few months, the snow in the mountains will begin to recede. Frost heaves will turn over what might have once been hidden. The wardens will go back out then. They could still solve this case. Jane Lee is ready, too. And she wants to make sure no one forgets about the case. Fliers are still tacked to trees throughout Madrid Township. There’s a shrine at the trailhead where George waited. This past year, Lee hiked up Mount Katahdin, since her partner couldn’t. At the top, she unfurled a big pink banner with Gerry’s name and picture. Kathryn Miles, a writer based in Portland, Maine, is the author of “Superstorm: Nine Days Inside Hurricane Sandy” and other books. Send comments to magazine@globe.com.